Everyone needs to get away from it all sometimes. This is especially true if you are on a never-ending road trip in the family RV, or if you share a room with your annoying little brother. If you can’t move out into the woods a la Henry David Thoreau, you will need to carve out a space for yourself wherever you can. You need, at the very least, to have a private place to sleep, and this can be accomplished with curtains on your bunk beds. We admit, this is not a lot of space to call your own, but, hey – its yours! A carefully placed curtain track such as our 32124 Low Profile Ceiling Track, or our 6100 Flexible Curtain Track, will allow you to create your virtual wall. The 32124 track is a low profile, aluminum curtain track with a silver satin finish. The 6100 flexible track is available in white, and can be bent by hand, without compromising strength, into angled or curved applications as needed. You can block out the world ever further with use of our Eclipse Light and Sound blocking curtain panels. 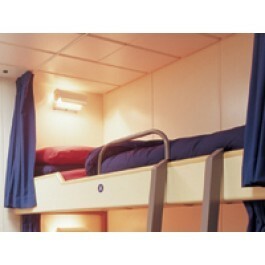 These curtains block 98% of light and are extremely helpful if you are trying get some sleep on a noisy ship, RV, or bus. These curtains can be equipped with snap tape in the header that attaches to any of our snap carriers. This setup is important in moving vehicles. They will release easily if grabbed roughly (bus driver taking the curves too fast?) without damaging the track or ripping the curtain. This quick release mechanism also allows for easy cleaning and quick décor changes. Did we mention these panels are machine washable? Passengers on your ship or bus will appreciate being able to have some space for themselves, and hanging a decorative curtain can warm up the décor of your home away from home. Hanging curtains on the bunk beds of your kids’ room gives you an opportunity to add a little color and interest to the look of the room, and kids love having their own space to read or get away from their siblings. They can be useful at playtime, too. Hide and seek anyone? For more design ideas or inspiration, visit us on Pinterest! What a great idea! My daughter will love this for her bunk beds.